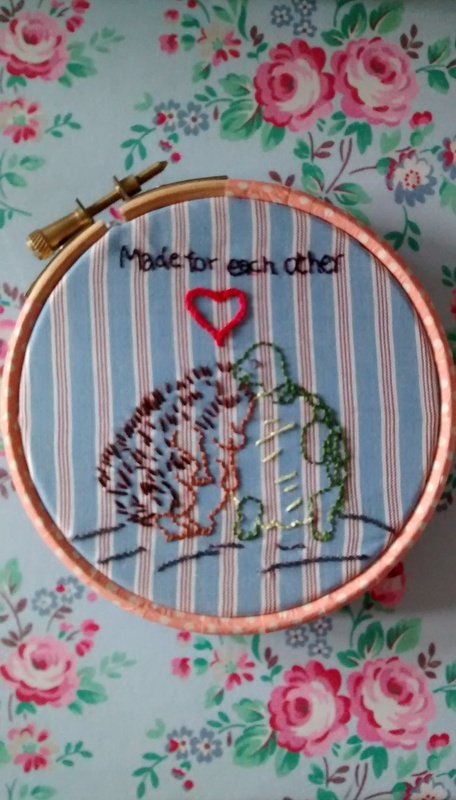 I know that the jury is out on Valentines day but in January’s Issue of Bustle and Sew’s magazine, Helen told a story that she remembers from her childhood, of a hedgehog that was lonely. Her prickles hurt anyone who came too close. She did however eventually find a lovely turtle to share her life with. It inspired her to create this pattern. There was something about the story I liked so I decided to make it. For me, valentines day isn’t just about celebrating with my husband (who is by the way wonderfully supportive and a great Dad) but also a time to take a step back and be thankful for all the people I do life with. I almost took the heart out of this design, as I have some truly amazing friends who put up with me during the ups and downs of life (not to mention my wonderful family). This design for me is as much to do with celebrating them as it is to say thank you for Hubby. Originally the pattern was for a lavender heart with the design embroidered on the front but I decided to keep it in the hoop instead. To finish it off, I used washi tape around the outside hoop. I’m pretty pleased with the finish and it’s giving me more confidence with my embroidered blanket (which has taken a back seat recently while I do this).